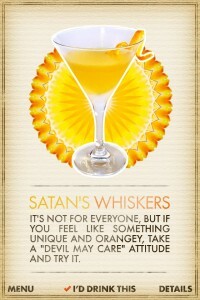 The theme for this month’s Mixology Monday is Forgotten Cocktails and we thought this would be the perfect opportunity to introduce the cheekily named Satan’s Whiskers as part of our new found commitment to monthly drink sharing. Is this really a ‘forgotten’ drink? Satan’s Whiskers can be found in Gary Regan’s The Joy of Mixology and in the modern Cocktail: The Drinks Bible for the 21st Century . But surprisingly enough this pre-prohibition drink doesn’t appear in David Embury’s guide The Fine Art of Mixing Drinks . We were a little on the fence about its forgotten nature so we went down to our local, and most reputable of cocktail joints. When they confessed a lack of familiarity, we thought the time was right to bring it back. But what kind of a drink is it, you ask? That’s a tricky one. The things we love about Satan’s Whiskers is that it connects the world of the sours (daiquiris, margaritas, aviations) and the aromatics (manhattans, martinis). Describing it as a hearty digestif is a polite way of saying – please have something to eat afterwards, it will make you hungry. Shake with cracked ice and strain into a chilled cocktail glass. 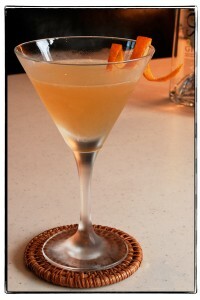 Garnish with an orange twist. If all those 3/4 ounce pours weren’t bad enough bad enough, it comes in two types; straight or curled – depending on if Grand Marnier or orange curaçao is being used. For MxMo we opted for the straight variety and made ours with South Gin, Lillet (we know it’s not a vermouth but we were feeling reckless), Martini and Rossi dry vermouth, Grand Marnier, and Regan’s #6 orange bitters. Historically, vermouth and orange juice have not always agreed with us, nor are we huge Grand Marnier fans, so we alway approach this drink with caution. Sadly, we’ve never been brave enough to order one in the wild so our experience has always been at our own hands. If our pour is well measured and steady and the vermouth reasonably fresh then this is a great drink – but we’ve had quite a few failures as well. Too much dry vermouth or too much Grand Marnier and is all goes horribly wrong, and when it goes south, it ain’t pretty. Thankfully, tonight’s drink was a success. The slightly empty feeling left by the orange juice is quickly replaced by the sweetness of the Grand Marnier and then the aromatic nature of the vermouth. Rather than a uniform taste profile, this drink hits in waves. 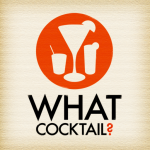 It has complexity to it and is certainly not something you’d want to serve a novice cocktail drinker. Satan's Whiskers as seen in What Cocktail? In fact, the debate over Satan’s Whiskers at the What Cocktail? iPhone app project was long and hard. First, it’s not common, second it’s not the most accessible drink, and thirdly it’s easy to mess up, and finally it’s only the kind of drink that makes sense in crisp autumn evenings or really early spring. Maybe it’s by grace of our sympathy for this devil of a drink that it made cut. We’d like to see it more often; if only someone else would make us one for a change. This is our small attempt to bring revive it. Big thanks to Dennis at Rock & Rye for hosting this month’s Mixology Monday and giving us a chance to talk about Satan’s Whiskers.